1. We started out Saturday with a prepared platter to share inspired by the Kinfolk concept of small gatherings. 2. Mary got a chance to photograph new jewelry she's been working on over the past couple of weekends and talks of a shop update later this week. 3 & 4. We got to the neighborhood farmer's market super early this weekend before the major crowds hit which is rare in our household. We've actually been trying to work with Basil on his separation anxiety (which is a whole other topic) and were up due to lack of sleep this weekend. In any case, the market was still busy but we got a chance to chat with some of our favorite folks including Rona of Sullivan's Pond Farm where those fresh figs and eggs came from. We love being able to say we've actually met the chickens that lay the eggs we eat and the fact that on a small level, we've completely opted out of the mainstream "food system" - at least when it comes to eggs. 5. At long last, we finally got to make homemade ice cream from scratch using our vintage hand-crank ice cream maker. We can't wait to share the details later this week. 6. 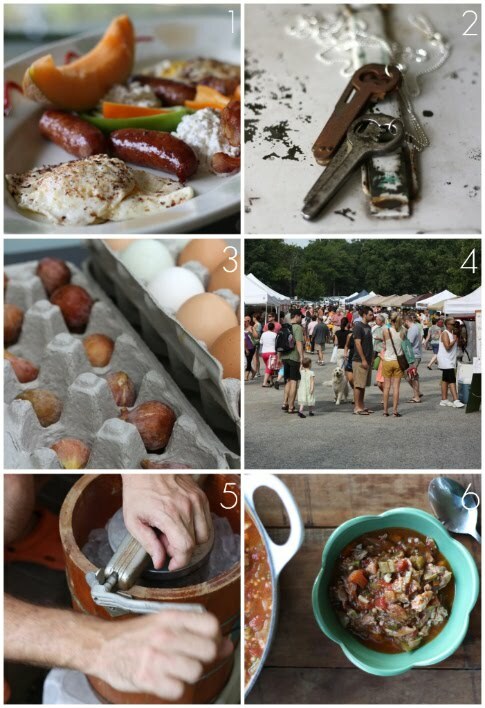 This summer pork & okra stew recipe I made yesterday was awesome (yes I said summer stew). I was not only able to use up all of the ripened okra pods from our garden, but have enough leftovers to feed us through a good portion of the week. And finally - did you think we forgot to include a photo of Basil in a Weekend Basics post? Of course not. Oddly enough, while at the market this weekend we always run into other dog owners and end up chatting. While talking to the owners of a 1 year old chocolate lab, this guy pulls out one of the most basic yet clever contraptions I'd ever seen for dog. Forgive me if I'm behind the loop on this one, but have you ever heard of the bottle shaped water dispenser called the Gulpy? A flask for dogs is more like what I call it! 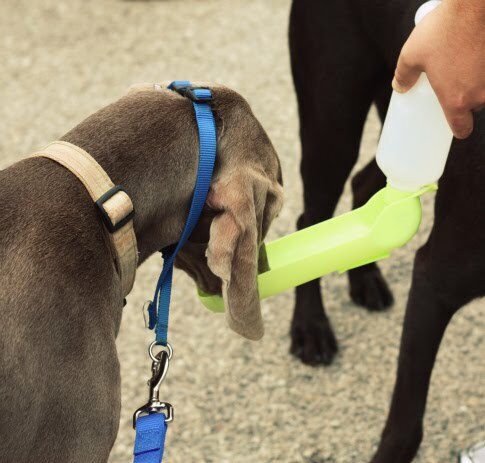 It's basically a water bottle with a tray attached to it that flips open and catches a trough of water squeezed from the bottle - the water stays contained, the dog can drink from it like a bowl, it's compact and can just be thrown in a tote bag. Basil had no trouble jumping right in there (he can be a little bit of a piggy around water). We literally went home and bought one online right away. Can't wait to get it. P.S. Our Food Inc. movie giveaway came to an end last night and the post has been updated with the two lucky winners - thanks to all who shared your favorite summer vegetables and stay tuned for future giveaways here on 17 Apart. The figs in the egg carton is a pretty cute idea. You really should consider getting your own chickens, though. They are super easy to take care of, and you can feed them all your kitchen scraps and garden extras. Having our own chickens is one of the many ways we "opt out." You are so right and we are SO jealous! For some awful reason, in Richmond Virginia there is a law requiring 1 full acre of land to own chickens. We're seriously considering going rogue and Rona (who we get our eggs from now) says she would love to give us a few of her Rhode Island Reds when we are ready. One hang up we're having is how it might pan out having Basil - do you all have dogs and how do you handle this? When we do get chickens, we'll be knocking on your virtual door for best practice tips! We do have a dog, a blue heeler, but she is well trained enough that she knows not to mess with chickens. I have heard a few dog-chicken-massacre stories, so I would test the waters with Basil before committing to chickens. You're going to need a fence anyway, so maybe you could sufficiently dog-proof it. This is a pretty fun site to browse around http://www.mcmurrayhatchery.com/index.html but you could probably get chicks or young chickens at your local feed store or off craigslist. I don't live in Portland, but I know there's a vocal and committed group of urban chicken activists who've fought hard to keep chickens legal in the city. I think the regulations are something like not more than 6 chickens per yard and no roosters. If you're considering going rogue, I would make sure you're on good terms with you neighbors. Maybe they would appreciate good locally-produced fresh eggs? While I guess it is possible to do fancy and complicated chicken projects, they are generally quite easy to take care of. Here's a random post from my blog about chicken poop http://waywardspark.com/?p=2070 (It's good stuff!) If you have questions, I can try to answer them. Thanks so much for featuring my shop in today's Finds! Camille - thank you so much for laying out all of these resources so readily for us. Looking forward to diving in as we continue to think about (dream about) chickens of own at some point down the road.